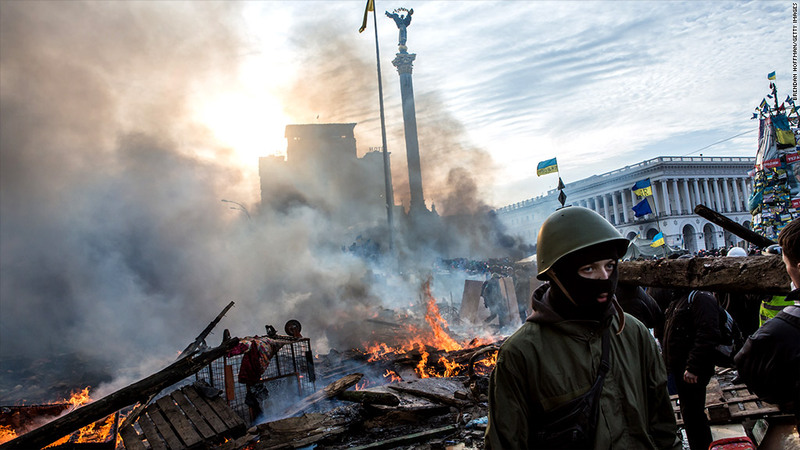 26 people were killed during violent clashes in Kiev, Ukraine, between government forces and opposition protestors. Russian money is keeping Ukraine afloat as the U.S. and the European Union consider imposing sanctions after 26 people were killed in anti-government protests in Kiev. Ukraine's powerful neighbor pledged earlier this week to buy $2 billion in Ukrainian government bonds, according to Russian media. That means Moscow has now released $5 billion from a $15 billion support package agreed late last year, when Ukrainian President Viktor Yanukovych announced his government was suspending talks on an EU trade deal and instead opting for closer ties with Russia. Thousands have packed Kiev's Independence Square since to protest against the government and its policy U-turn. On Tuesday, 26 people were killed in Kiev, and hundreds injured, in the deadliest day of protests yet. The crisis has hit Ukraine's economy hard, depleting foreign currency reserves and depressing the currency. Fitch cut Ukraine's credit rating to "CCC" earlier this month, implying a real possibility of default. But continued support from Russia should mean Ukraine will be able to repay billions in debt falling due this year. "In the near future, [default] risks are not really high because Russia continues to help and provide financing," said Russian economist Vladimir Osakovskiy from BofA Merrill Lynch. Even so, the country is running dangerously low on cash, with foreign currency reserves falling to around $17 billion -- enough to cover only two months' worth of imports. Osakovskiy reckons some $9 billion in debt repayments are due in 2014. "[The $17 billion is] not sufficient to finance the debt without outside assistance, in this case, Russian assistance," he said. The Ukrainian currency slid by 0.7% versus the U.S. dollar Wednesday, and has declined by roughly 8% since the start of the year. U.S. Secretary of State Kerry said Wednesday that sanctions were being considered, and EU foreign ministers are due to meet in Brussels Thursday to consider targeted action against individuals. Osakovskiy said the sanctions could involve travel restrictions on individuals responsible for the violence in Ukraine. Governments could also freeze bank accounts and assets in Europe and the U.S. and could place restrictions on conducting business with these people and their companies.